In its Sept. 2009 issue, Humanimalia, a journal of human/animal interface studies, reviews Nicole Shukin's Animal Capital: Rendering Life in Biopolitical Times, the sixth installment in the University of Minnesota Press Posthumanities Series. 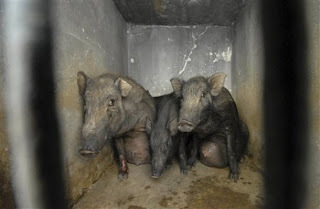 The article uses this April 2009 AP photo of pigs captured in Hyderabad, India (as an attempt to monitor and contain the H1N1 swine flu pandemic so the city could go on with its business) to illustrate the critical framework of Shukin's book, which studies "how animal life is enmeshed in and integral to market cultures." The central argument that capital routinely takes the form of animals – in both fetishized figure and usable flesh – confronts animal studies’ tendency to bracket off one for the sake of the other. Against her own disciplinary training as a literary scholar, Shukin insists on thinking these two dimensions of animal life together, on simultaneously foregrounding the “semiotic currency of animal signs and the carnal traffic in animal substances” across various sites of capitalist production and the social world more broadly; in effect, laying out a history and theory of animal-as-capital (7). In this sense, Animal Capital rephrases the pivotal “question of the animal,” posed by Cary Wolfe and pursued by other poststructuralist critics, in a firmly materialist register, but one that also takes seriously the seductive immateriality effects of animal imagery.